Iulia Calota » Why it’s important to be an essentialist in love? Why it’s important to be an essentialist in love? ‘Essentialism: the Disciplined Pursuit of Less’ by Greg McKeown is a book I’ve been engrossed in over the last few weeks (mainly during my morning commute in order to make the most of my limited time). It is (excuse the punt!) an essential read in word dominated by the glorification of busy.It is a book that helped open my eyes to all the trivial activities I engage into thinking that they are of paramount importance. “You cannot overestimate the unimportance of practically everything,” said the author and the more I read, the more I realised that only by cutting away mercilessly activities that do not matter or do not align with your objectives, one can make real progress. 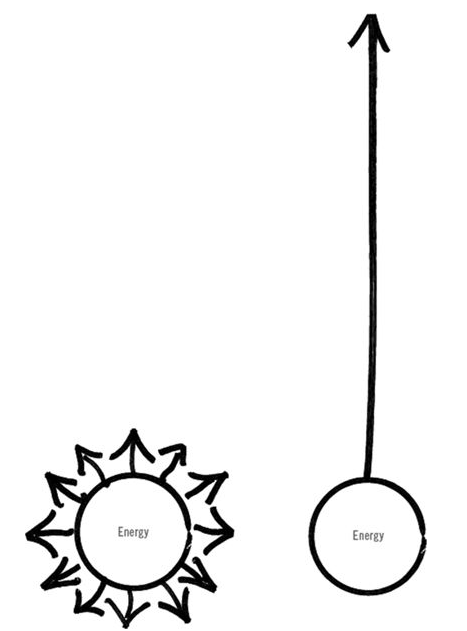 The diagram below is actually very illustrative in showing how diffusing your energy brings very little result, while focused energy takes you perhaps ‘where no one has gone before’ Star-Trek style. Of course, I was excited to immediately apply some of the book learnings into my life and to focus my energy more constructively. Taking on board some of the advice, I used an automated e-mail reply in which I warned people I was unavailable to communicate last week, as I was in France working on the last edits to the entire manuscript of The Love Project. I also postponed activities to a later date when I felt overwhelmed at work and preferred to focus on getting the projects done first. But what really got me excited was realising how much the same principles applied to dating. In dating, even more than in business, it can be very difficult to apply essentialism. Love seekers tend to focus on covering as many basis as possible, in the search for the one. Exposing oneself to as many leads and sending as many messages as possible to potential partners is one way to ensure efforts are maximised, but it can also be very frustrating and can leave you depleted. You also become less preoccupied with quality and find yourself hopelessly tangled in quantity. But most importantly, essentialism in dating is figuring out clearly what is it that you are after. When I started The Love Project I wrote a set of objectives and had a pretty clear definition of who I wanted to meet. However, I did not act in an essentialist manner through and trough and found myself on long detours with ‘scope creeps’ more often than I liked. Again, this left me depleted of energy and demoralised. Being focused on exclusively pursuing what fits with your requirements is the surest way to avoid wasting your energy and resources and, as a consequence, making very little progress in the long run. Starting something is important, but sticking to it is essential! Make sure you don’t get seduced by something else that seems like an opportunity, because more often than not opportunities are just stumbling rocks in your path to achieving greatness!